WordPress Blog to PDF: WordPress blog to pdf generator bears two prominent features of getting the desirable revision of post as it keeps tracks of all the post revisions and generates its pdf to read it in offline mode. It holds a large variety of customizations from pdf generate button to the generated pdf. One can choose where to place pdf generate button either in right or left. Before generating pdf one can customize color, size, and contents. Blog Content will be available and can be accessed in Offline Mode as it is exported as a PDF Doc. 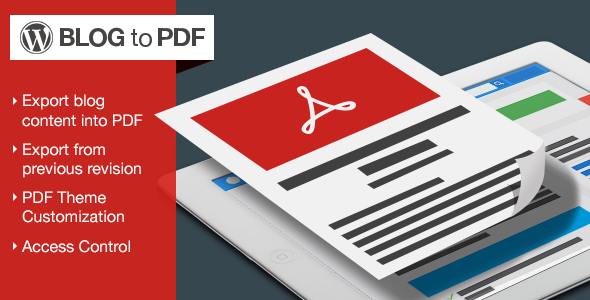 WordPress Blog Revisions can also be Exported as a PDF Doc. PDF’s Color and Font Options can be Customised. For the downloaded PDF, Background color and the Heading Background color can be changed. Watermark can be added to the PDF being generated. Front-end button position can be set as Fixed or Absolute. PDF Download version can be chosen as – Latest Revision or All Revision. Under all Revisions you can select from – Monthly(User gets the latest revision of the month ), Yearly(Users gets the year wise latest version) or All revisions. Did you buy Blog to PDF for WordPress?